Interstate Commerce Commission issued its first regulations covering driver qualifications, driving rules, safety equipment and accessories, and how to report accidents. 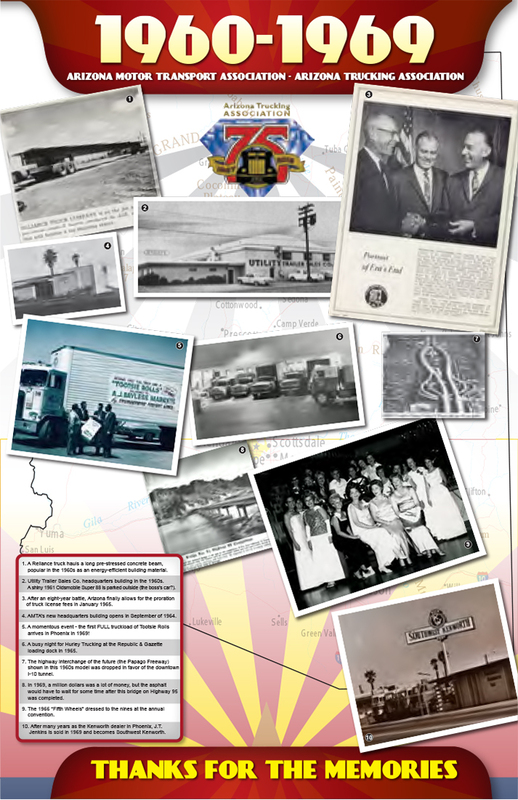 The Arizona Motor Transport Association (AMTA) was incorporated on September 8, 1937, by a group of sixteen trucking company owners who filed Articles of Incorporation shortly after the 1937 enactment of the Federal Motor Carrier Act. Glenn Sharpe was hired as the Managing Director. The new association held its first annual convention that year. 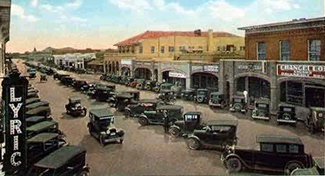 The first National Truck Rodeo was also held in 1937. 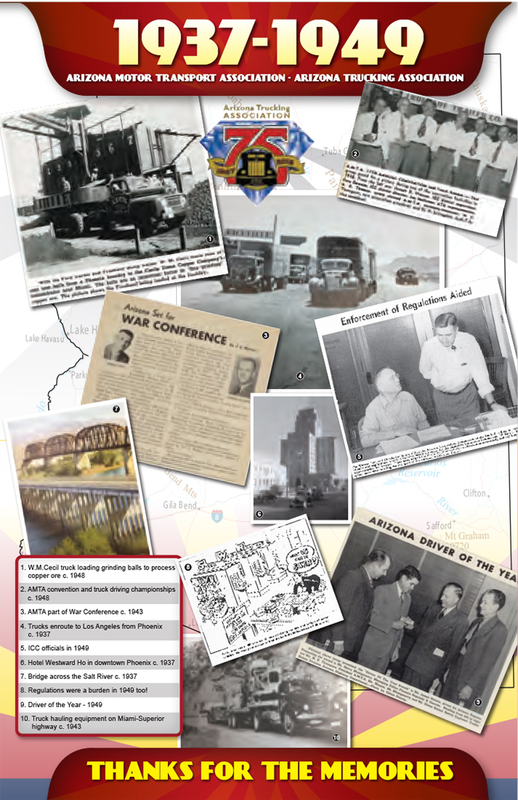 In 1947 the Arizona Motor Transport Association celebrated its 10th Anniversary. Trucking was prospering, but being challenged by a huge postwar surge in traffic brought about by a major influx of new residents to the state, thanks to the military bases and defense industries built here. Arizona was on pace to experience a 50% increase in population for the decade. Wire cord tires were tested for heavy-duty trucks, and Goodyear introduced an all-nylon ply tire. 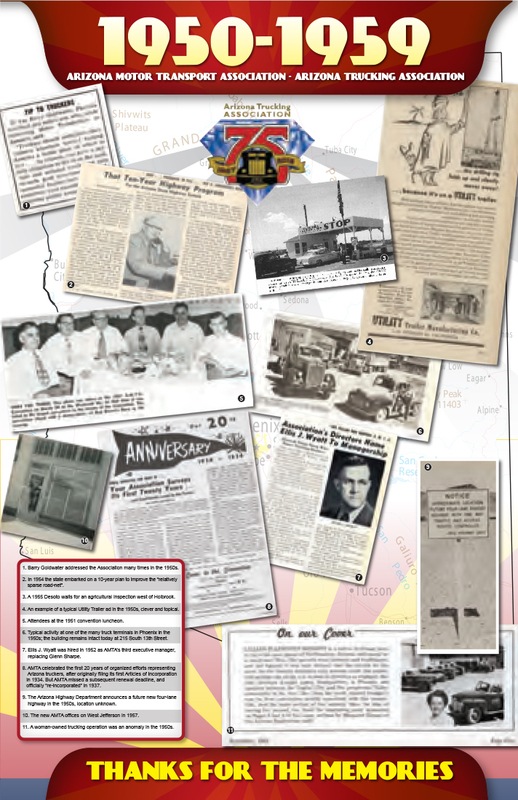 Back in 1950 legislative advocacy was as much a part of the association’s mission as it is now. In the 1950 state legislative session, the AMTA worked with the legislature to keep truck lengths at 65 feet and height at 13.5 feet. Meanwhile it helped pass the state’s Uniform Traffic Code, a 30,000-word bill. Nearly 200 truck operators and drivers attended an all-day safety conference sponsored by the AMTA and the Maricopa County Chapter of the National Safety Council. 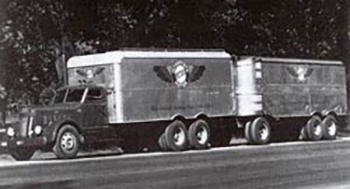 In 1957 the gross revenues of the 18,000 interstate trucking companies operating under Interstate Commerce Commission authority totaled approximately $6.2 billion, compared to $5.9 billion reported the prior year. Pacific Intermountain Express (PIE), Western Truck Lines, Navajo Freight, Illinois-California Express and Watson Brothers Trucking filed a petition asking the ICC to deny the Santa Fe Railroad trucking subsidiary operating rights between Los Angeles and Holbrook, Arizona. 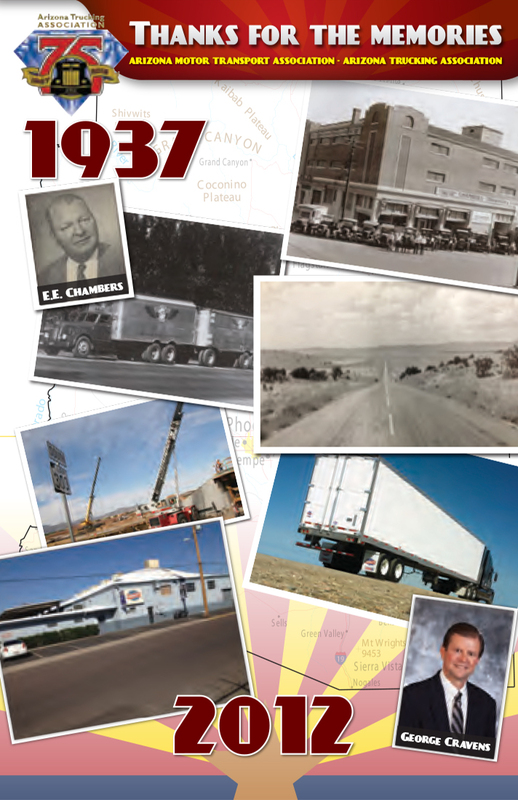 By 1957, Ellis Wyatt was in his third year as Managing Director, and Howard Clark of Arizona Pacific Tank Lines was elected to his third term as president of the Arizona Motor Transport Association (he would serve a total of six terms in that position). 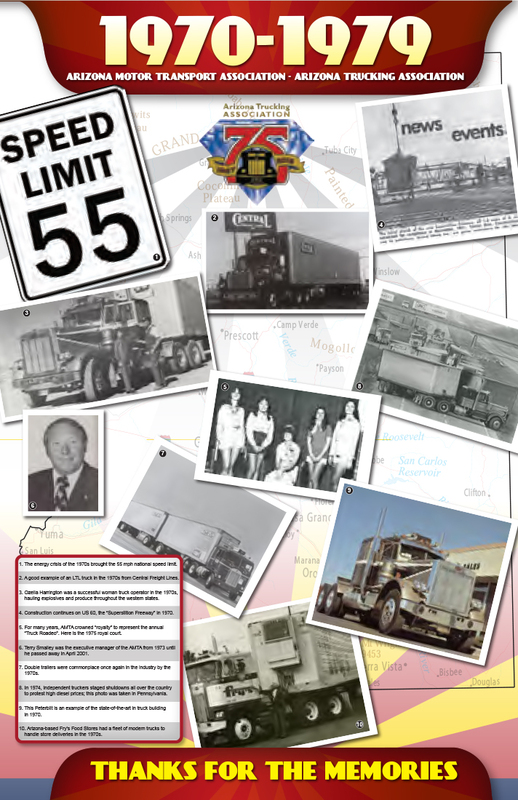 By 1966 the trucking industry was maturing. 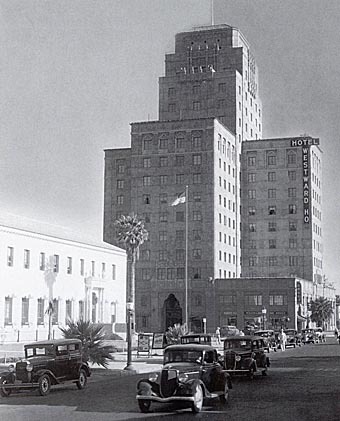 It employed 109,000 Arizonans or one of every 15 residents. The AMTA had a membership of 85 in-state and 22 out-of-state companies. Emral Ruth had replaced Ellis Wyatt as Managing Director. Highway user taxes paid by Arizona trucks totaled $850,000 a week. Also that year AMTA adopted a group insurance plan that saved members 20-40%. 1966 also saw the introduction of computers for shipment information, payroll and other tracking. 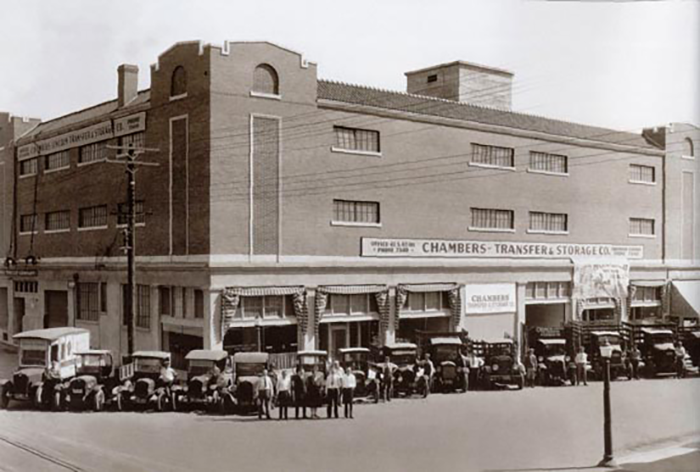 Thunderbird Freight Lines and Hopper Truck Lines led the way in Arizona. In 1973 the association hired Terry Smalley as managing director following the sudden death of Managing Director Ollie Arbelbide, who had served just 14 months. Smalley led the organization for 28 years, spearheading the fight to repeal Arizona’s onerous “ton-mile tax” and helping pass numerous trucking-favorable laws. He was named AMTA Man of the Year in 1993. 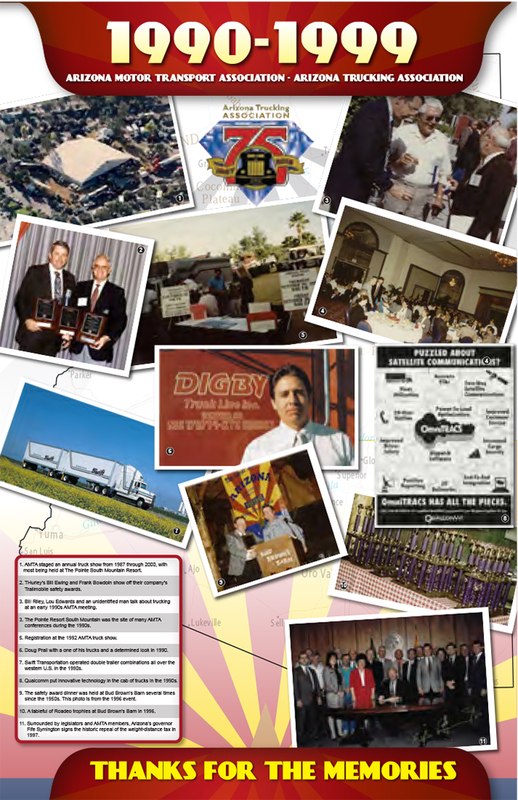 After Smalley suddenly passed away from a heart attack in March, 2001, AMTA rallied to hire Karen Rasmussen, a former executive with the California Trucking Association and Director of Government Relations for Ryder Systems. Karen continued efforts started under Smalley to develop a full-service Motor Carrier and Tax Services program within AMTA to help motor carriers meet regulatory requirements, resolve issues and obtain other help. AMTA completed “Trucking in Arizona,” a research project that found Arizona carriers employing more than 110,000 people with a combined payroll in excess of $2.5 billion. 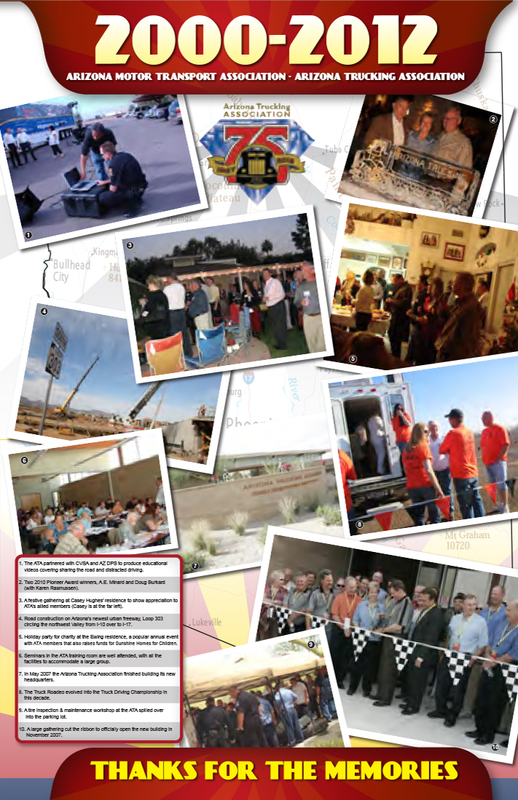 The association changed its name to the Arizona Trucking Association (ATA) and in 2007 moved to a new headquarters. The modern ATA facility is located on 75th avenue just south of Interstate 10 in Tolleson. Looking to the future, ATA chartered the Arizona Transportation Education Foundation, (ATEF) as a non-profit charitable subsidiary to develop safety programs and provides college scholarships for kids of families associated with the industry. The new ATEF helped grow the “Share the Road” public education program as well as creating the “Teens & Trucks” driver education curriculum and the popular “Defeating Distracted Driving” commercial driver training program. ATA became the 27th state association to pass an anti-indemnification law prohibiting most shippers from making truckers responsible for the shipper’s negligence. 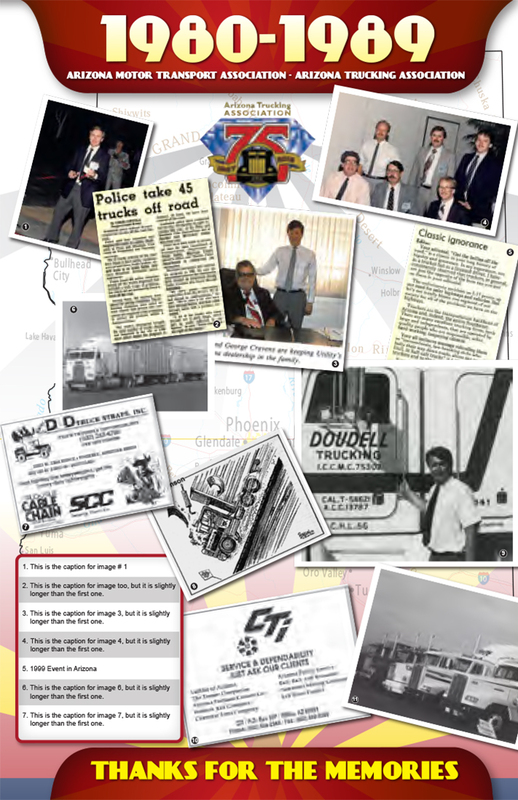 Swift Transportation vice president Dave Berry, who served as AMTA president in 1981-82, said the fight to pass the anti-indemnification legislation in 2011 epitomized the “David versus Goliath” battles of trucking issues in Arizona for decades. Since 1937, the Arizona Trucking Association has worked to ensure that trucking remains a viable industry in Arizona, free of punitive taxes, job-killing regulations and uneven or unfair enforcement. Its members expect to see no less in the future and know that ATA will be there to help them be successful and profitable.